„Mmh, what’s that?‘ – ‚Wine!‘ – Great, Emma. Very precise.“ Reading this blog post (the first one of its kind) one could think, it would be impossible to start a business in a market, where knowledge is not only essential but also almost seen as art itself. But if the right components meet each other even the biggest barriers can be overcome. In case of „Großstadthelden” (analogous: urban heroes) not only the right ingredients met, but also the young people with the right, fearless mindset. Although coming together with completely differing backgrounds and specializations… or not even knowing what their subject areas specifically were, Lisa, Günther, Joe and Emma managed to place their faces in the picture of the multifaceted wine world. 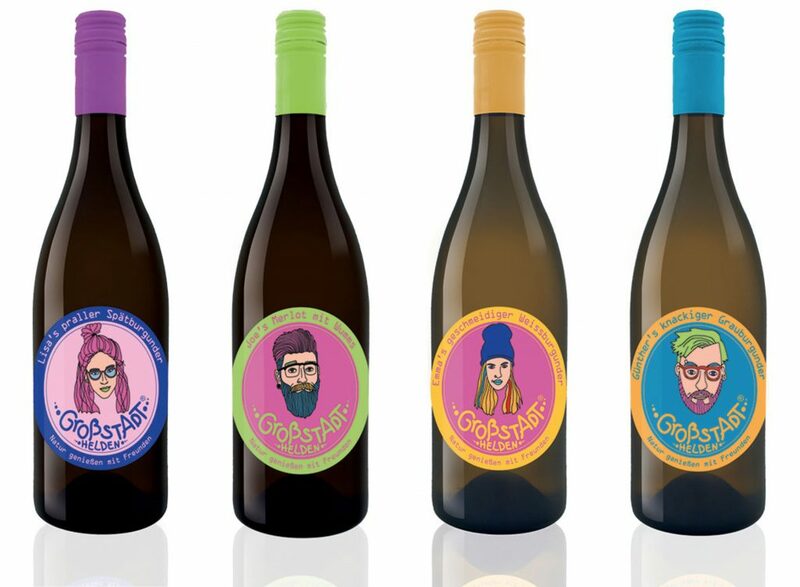 This is not a joke, they literally did – by placing illustrations of themselves onto their wine bottles. (By the way, these colorful self-portraits triggered our creative senses and made us stop by their booth) Fortunately Bio-Weingut Welter (Organic-Winery Welter) offers a bigger product range so that every hero got his own bottle with his face. Apart from its, for the wine world unusual outer appearance, a customer, whether experienced or not will be able to enjoy a product, made with passion for the taste and ecological responsibility. From a small village into the big city – is an organic wine something todays urbaners need? „YES” Joe said. After tasting the wine for the first time he said, that this is a product he was missing in the city. Well, some random guy once said, “Stay hungry, stay foolish” and as far as I remember he was quite successful with his unusual ideas. So keep it up heroes we wish you success.